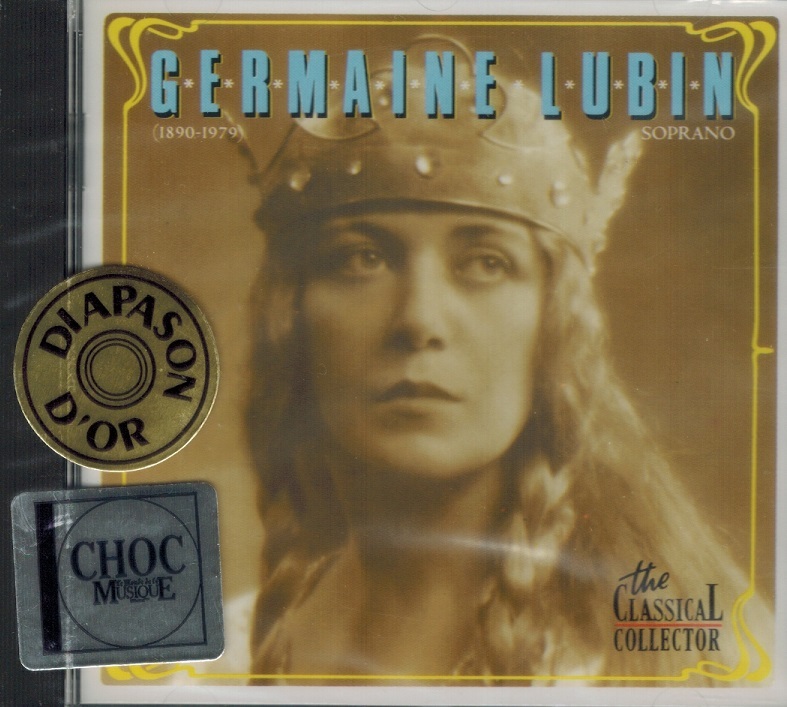 “In 1912 Germaine Lubin made her début at the Opéra-Comique, singing Antonia in THE TALES OF HOFFMANN, to an audience which included Claude Debussy and Paul Dukas; she enjoyed a great success. At the Opéra-Comique, Albert Carré gave her the chance to appear in several contemporary operas, including Gabriel Fauré's PÉNÉLOPE (title role). She also sang Charlotte in Jules Massenet's WERTHER and the title role in Gustave Charpentier's LOUISE, and appeared in the world premiere of LE PAYS by Guy Ropartz. Lubin made her first appearance at the Paris Opéra in 1915, in Vincent d'Indy's LE CHANT DE LA CLOCHE, and continued to sing there for nearly 30 years. In addition to standard French works, she also found success in the operas of Gluck and Strauss, singing the first French performances of ELEKTRA in 1932. She also created roles for d'Indy, Darius Milhaud, and Henri Sauguet (LA CHARTREUSE DE PARME) and sang the title role in the 1935 revival of ARIANE ET BARBE-BLEUE by Dukas. In 1921 Lubin embarked on the series of Wagner roles for which she would be most admired. She performed ARIADNE under Strauss in Vienna, also singing Octavian and Agathe to critical enthusiasm, later taking part in the Paris premieres of DER ROSENKAVALIER in 1927 and ARIADNE AUF NAXOS at the Opéra-Comique in 1943. In 1930 she sang Isolde at the Paris Opéra for the first time and met with an ecstatic reception. Her physical beauty - she was tall, slim and blonde - and her strong, even voice made her ideal for the part. She went on to sing it again in Paris in 1938 (this time in German, conducted by Wilhelm Furtwängler), and in London in 1939 (at the invitation of Sir Thomas Beecham). In July 1939 she became the first Frenchwoman to sing Isolde at Bayreuth (under the baton of Victor de Sabata). At Bayreuth, she established friendships with members of the Wagner family. 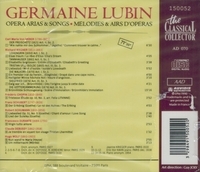 Lubin hoped to sing also at the Metropolitan Opera, having been recommended to the Met's management by Kirsten Flagstad. Owing, however, to the outbreak of World War II in 1939, she never sang in the United States. After the German occupation of Paris in 1940, Jacques Rouché sought to re-open the Opéra and invited Lubin to return to sing ALCESTE. This was followed by performances of FIDELIO and DER ROSENKAVALIER, and in 1941 she again sang Isolde, this time with the visiting company of the Staatsoper from Berlin under the direction of Herbert von Karajan. 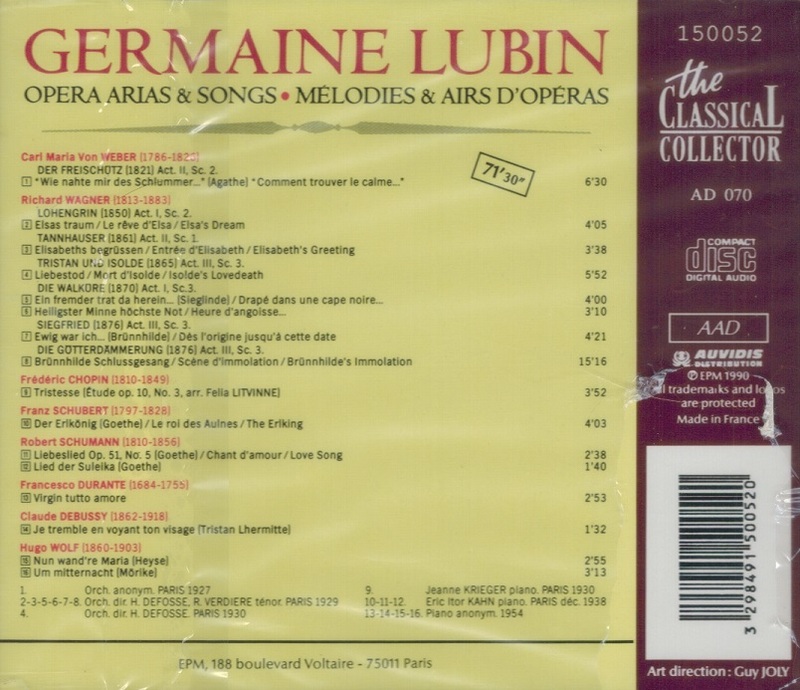 In 1950 Germaine Lubin had returned to Paris and sought to resume her career with a recital. Although she met with some sympathy and gave a few further performances, it was a difficult transition, and when in 1953 her son committed suicide she abandoned public performance entirely. For the remainder of her life she became a voice teacher, giving lessons at her home on the Quai Voltaire in Paris. Among her notable pupils was the leading soprano Régine Crespin. Lubin died in Paris in 1979 at the age of 89. Lubin had a powerful voice of gleaming tonal splendour. By her own admission she was a forceful and demanding personality, often haughty and distant with other people, and she responded to the heroic dimension of the characters that she portrayed on the operatic stage. ‘I do not like to sing the role of victims’, she said in an interview.